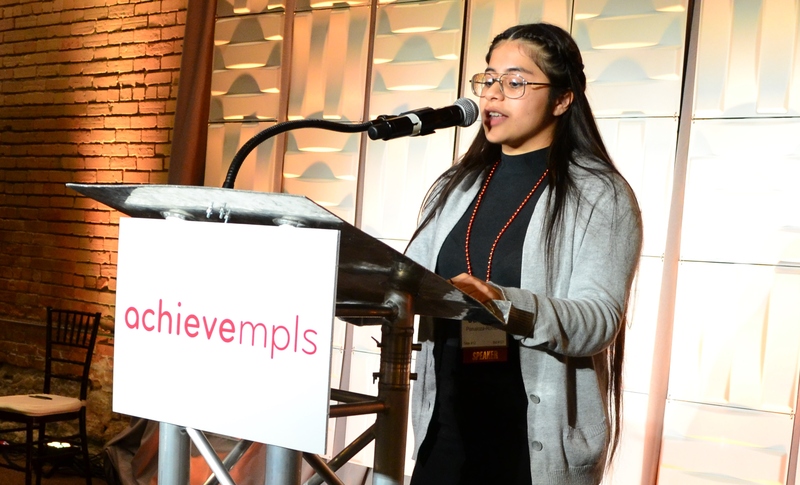 Edison High School senior Jasmine delivered this moving speech at our October 4 Evening of Excellence, where over 300 people came out to celebrate the work of AchieveMpls and support our career and college initiatives. so you leave a mark just like a scar. your story can change lives and touch hearts…..
Good evening! My name is Jasmine and I am a Latinx Senior at Edison High School. I am currently working on becoming a lawyer as well as a judge in my future. I love reading, sports and helping youth and my community. I have been translating for my family since the age of 7, from doctor’s offices to lawyer’s offices at the age of 17. My brother has recently been deported and before he was deported I had the opportunity to see him, but only see him. I didn’t get to hug him one last time, before he got sent to a county he hasn’t seen in 20 years. This is real and it’s something I have been dealing with for a long time, to be scared that at any moment it could be someone else that I love. I have been my mother’s personal interpreter, and been in and out of courtrooms from such a young age that I have multiple legal experiences. I want to make a difference. That’s what the Career & College Center has guided me to do. The CCC has helped me so much. I cannot thank them enough. They have motivated me to think about my future after high school. They have been such a great help with writing college essays and job resumes. They helped me get a Step Up internship in a field I am interested in. My CCC coordinators Andrew and Nora are the best! They help you in any way they can and they always make you feel great. When they guide you in a career path, they make sure to tell you your best options and they are great at listening to what you have to say. If there was no CCC, I’m pretty sure I wouldn’t be motivated to apply for college. I wouldn’t know about the Step Up Community Planning & Economic Development internship I had last summer at the City of Minneapolis. I wouldn’t even know about visiting colleges and universities like Hamline, Bethel, St. Kates and many more. I wouldn’t be excited for college. I would be scared. I wouldn’t know what my future would hold or all the possibilities. But now I have a plan. Next fall I hope to go to Hamline University to begin to study law. As I said earlier, I want to become a lawyer someday, and also a judge. The Career & College Center has been such a wonderful part of my high school experience. I am very grateful for this program and I want to thank all of you here tonight for supporting the Career & College Centers and students like me.